We’d love your help. Let us know what’s wrong with this preview of The Heretic's Guide to Best Practices by Paul Culmsee. 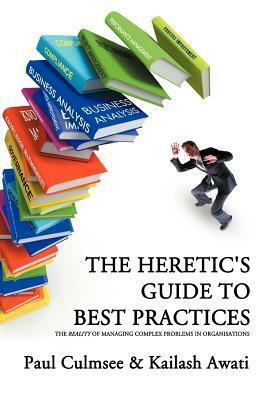 To ask other readers questions about The Heretic's Guide to Best Practices, please sign up. A refreshing look at the process by which companies grab at 'silver bullet' solutions like ITIL, PIMBOK, PRINCE2 and others (those are just the few the came to mind from my organisation). The take out seems to be we should spend a bit more time looking at how/why these systems do/don't work versus just propelling ourselves from one shiny object to the next. Humour: The book has a nice conversational style that makes it feel more like a interesting conversation in a pub. Many of the quotes that start each chapter made me smile. Structure: The book is split up into three distinct sections (Theory, Practice, Case Studies). To my mind this helped it avoid the sort of 'self-help' book fatigue that I've noticed in the past with other thought provoking tombs where the author makes his points in the first half of the book and spends the remaining 200+ pages just kind of stumbling their way towards a fairly aimless conclusion. Concrete examples: I really liked the fact that having established their ideas they ran through some very practical and real-world examples of applying the same concepts. First class and something that would be well applied to other books in this class. Too often this kind of thing is heavy on theory; light on the practice. Can't think of anything right now. I suppose it might have been nice to have a bit more advice on developing dialogue mapping skills and how those skills can be used to integrate with other techniques (this was mentioned but I could have done with some more). Highlight: I really loved the Kapitola(I think that's the name) diagrams. Simple and easy to use. I think I'd started using these myself and used them to suggest the book to about three friends before I'd even finished the book. If I get one good thing out a book like this I'm usually pretty happy and for me the Kapitola diagrams were that thing. Very well researched & written - although I must be the referenced only non-Star Wars fan reader. I like the case studies and the simplicity of IBIS for dialogue mapping - but I can see the need for a skilled practitioner for really wicked problems. I worked with Paul in a previous company - in his previous life in sys admin. I knew he was smart - but not this smart :). Nice work! The book covers incredibely useful ideas (principles and tools) for untangling and even possibly solving wicked problems. I just wish it was better written, with more structure and fewer disjointed thoughts.